More than 300 people attended an open house on March 16 to celebrate renovations to the main floor of Christian City’s Skilled Nursing & Rehabilitation Center and Assisted Living Center. The 500-acre campus located on the south side of metro Atlanta in Union City is home to more than 1,000 seniors. Event attendees enjoyed hors d’oeuvres and guided tours of the renovated main floor of the facilities. Popular features of the new space include several new dining options, renovated and refurnished lobby areas, therapy rooms, offices, a library, chapel and 232-seat auditorium. Several smart TVs installed around the main floor broadcast activities, events and transportation schedules, dining menus, and other helpful information of interest to residents, patients, their families and guests. A 50s-style diner, casual dining room, and separate formal dining room are now available on the main floor,” said Steve Sheets, Administrator of Christian City Skilled Nursing & Rehabilitation Center. “Our chef works with our dietician to offer a healthy menu with a variety of food choices for our Assisted Living residents, Skilled Nursing & Rehab patients and their families,” Sheets said. Table-side service will begin soon. In addition to these three dining options on the main floor and meal service on each residential floor, residents and patients now have a full-service kitchen/dining room space that may be reserved by families to celebrate a special occasion with their family member in residence at Christian City. “We listened to the families of our residents and found that they desired a space to enjoy a home-cooked meal with their loved one without leaving Christian City,” said Hudie Langston, administrator of Christian City Assisted Living Center. The special occasion space includes a full-service kitchen featuring stainless steel appliances, granite countertops, built-in cabinets, a food service island, and a dining table with seating for eight. The outdoor courtyard, which is also furnished with plenty of tables and comfortable seating, is accessible from the special occasion kitchen/dining space and from the newly renovated auditorium. Programs ranging from live music and line dancing to educational and entertaining speakers take place in the auditorium. “Our residents enjoy a variety of activities and events, both on-campus and off-campus, that add to the vibrancy of senior life here,” said Len Romano, president and CEO of Christian City. Spiritual life is also an important part of living at Christian City. “We have staff chaplains who, along with a group of dedicated volunteer chaplains, bring spiritual support to the residents of our communities,” said Carl Ryden, chaplain and chief spiritual care officer. Christian City provides a variety of spiritual programming, including worship, Bible study and other special services in both the auditorium and newly renovated chapel. “Residents attend from across the campus, including those who find it difficult to participate in off-campus activities at their own churches. Area churches provide a vital help by coming to Christian City to lead services for our residents”, said Ryden. The main floor also includes a newly renovated and beautifully furnished library, featuring not only a wide variety of books for residents to check out and comfortable spaces to gather and read, but four computers with internet connections are also available for use by residents. As guests toured the main floor during the open house event, they also took note of a series of eight “I am” statements gracing the renovated walls of the main floor. Serving as both artwork and core value statements, the series speaks to the Christ-centered values that have guided Christian City’s leaders since the organization’s founding in 1965 when the first cottage for eight homeless boys opened. The March 16, open house program opened with a short video highlighting the 52-year history of Christian City. President and CEO Len Roman, welcomed event guests and spoke about the company’s recent rebranding effort. “The fish at the center of our new logo points upward to heaven in honor of Jesus. In addition to symbolizing the Christian Trinity, the three leaves in our brand mark also indicate the unity and interconnectedness of our staff, residents and volunteers,” Romano said. “Christian City has had an amazing journey over the past 52 years. Who knows what’s next? We have a 500-acre campus and more than 200 acres are still undeveloped,” he said. After fulfilling the community’s need for a children’s home in the mid-60s, the need for active senior housing, a nursing home, and assisted living center were fulfilled at Christian City over the next two decades. Fred Watson, current Board of Trustees member and leader during the building of the Skilled Nursing & Rehabilitation Center in the 70s, shared with the crowd how the Center came to be built almost 40 years ago. Watson shared a few little known facts about the Skilled Nursing & Rehabilitation building. The general contractor for the nursing home had previously built a couple of notable structures in Georgia, according to Watson. “Our builder had not previously built a nursing home, but he did build the Scream Machine roller coaster at Six Flags over Georgia and Sanford Stadium at The University of Georgia,” Watson said. Watson recalled touring the new space in 1978 with John Sparks, founder of Huddle House and friend of Christian City. Upon completion of the nursing home, Sparks provided all the necessary kitchen equipment at no cost to Christian City. The John and Polly Sparks Foundation has continued to support Christian City’s ministries over the years for both children and seniors. Brock Peyer spoke at the open house on behalf of the Foundation. “We had no money, but we had a vision,” Watson said. “We received assistance from various church members and board members to secure financing. We did a lot of praying and we had faith,” Watson said. “I spent some of the best days of my life at Christian City,” he concluded. Carl Ryden closed the program with a prayer of dedication for the renovated space. “Thank you for giving us the privilege of serving one another….may the unconditional love of Christ be found in and through the services provided here,” Ryden prayed. Today, the Christian City Skilled Nursing and Rehabilitation Center is consistently ranked as one of the top nursing homes in the country. “We are pleased to have been included in US News & World Report’s list of best nursing homes for three consecutive years,” said Steve Sheets, Administrator of the Skilled Nursing & Rehabilitation Center. “We are committed to providing quality care and rehabilitation for our patients, which also provides peace of mind for their families,” Sheets says. During his remarks, Sheets thanked the companies and key individuals involved in managing the $5 million renovation project: General contractor, Choate Construction’s John Schrader, Dean Pye and Alex Duer; Sharon Foley and Mara Neuman with Foley Design; and Nicole Frazier and Chuck Brown with Pruitt Health’s Planning and Development department. Last, but not least, Sheets thanked the Director of Facilities Management at Christian City, John Kimmons, for overseeing the 11-month renovation project. Kimmons received a standing ovation in honor of his upcoming retirement on March 31 after 40 years of employment at Christian City, serving first as a house parent in the ‘70s. 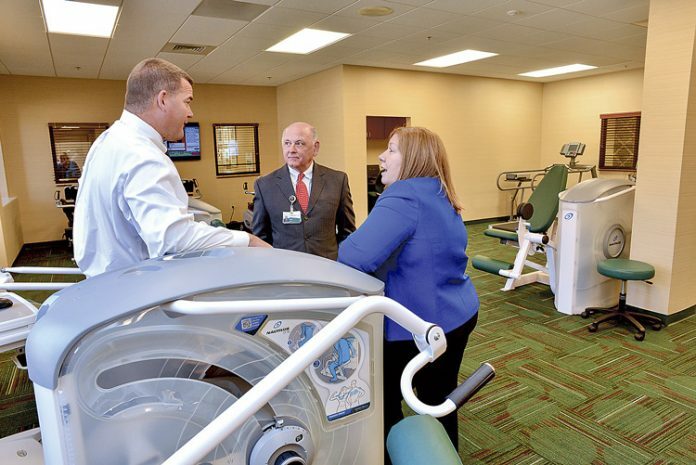 In 2009, Christian City partnered with Pruitt Health to operate the 150-bed Assisted Living Center and 200-bed Skilled Nursing & Rehabilitation Center, which are owned by Christian City. The 500-acre campus also includes over 200 patio homes, subsidized apartments and many volunteer opportunities for active seniors. With the addition of Pruitt Health’s on-site pharmacy, home health care, and hospice services, the full continuum of care for seniors was made complete at Christian City. Christian City Children’s Village continues to provide family-structured homes for children ages 5-17 who have been abused or abandoned.